University of Utah School of Computing graduate and Westminster computer science professor Helen Hu will receive the Governor’s Medal for Science and Technology for developing a new innovative high school computer class, the Utah Governor’s Office of Economic Development announced March 16. Hu is training teachers from around the state on a new course that promotes computer science and its impact on everyday life as opposed to focusing on writing code. The purpose is to attract more underrepresented minorities and females to computer science. 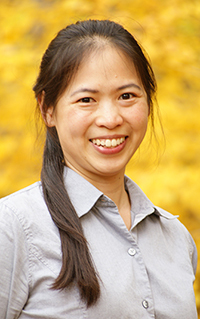 Born and raised in New Jersey, Hu received her bachelor’s in computer science at Princeton and later earned her doctorate in computer science from the School of Computing at the University of Utah. Instead of pursuing a career in the tech industry, Hu has always wanted to become a teacher. Her new course is the result of a three-year National Science Foundation grant, and she hopes that the Utah Office of Education can take over the program’s development after the grant runs out. Additionally, she wants to make the AP Computer Science Principles class more available to high schools across the state. This is not the first honor Hu has received for her course. She also received one of the 2014 Women Tech Council Education Excellence Awards late last year. In addition to Hu, four University of Utah faculty members will receive the Governor’s Medal for Science and Technology, including biology professors Phyllis Coley and Erik Jorgensen, pathology professor Ronald Weiss, and Troy D’Ambrosio, assistant dean of the U’s David Eccles School of Business and executive director of the university’s Lassonde Entrepreneurship Institute. The Governor’s Medals for Science and Technology are awarded to residents and companies for distinguished service or for significant contributions to Utah’s science and tech industries.